“Calm is a super power,” Rachna Clerci, Rainbow Kids-certified yoga teacher, tells her students in the yurt — a tall, traditional tent originating from Central Asia. Located at Healing Waters Center for Yoga in East Aurora, the yurt roots in a lush green nature reserve, surrounded by wildflowers and the rushing waters of Cazenovia Creek. Mini yogis (“yoginis”) stand inside on one foot with the other in a figure-four; Hands are at the heart in prayer. This is tree pose, but they’re learning more than physical balance. It’s about stillness. Quieting the mind. Connecting with your surroundings. More than ever, children crave, need and practice mindfulness in Buffalo. Classes come in the form of art, yoga and music. All focus on the present moment, concentrating on one idea at a time. Collecting colorful flowers and rocks to create mandalas can be more compelling than the fragmented, filtered reality of Snapchat. These zen experiences are the antithesis of what children are used to in school, where senses are heightened, planning ahead is crucial, and multitasking is second nature. Mindful-class teachers show kids how to simplify — a tool relevant beyond the studio. “The goal is to teach children to find a calming place,” says Clerici in her Mindful Me class. They set stuffed animals (“breathing buddies”) on their stomach to focus on breathing from the belly. During stressful moments — bullying, tests, rushing around — Clerici encourages kids to remember their belly breaths and feel peaceful. This meditative state also comes through art and music. Music focuses on auditory and visual senses. There’s body awareness (the shape of their mouths when singing, or curving fingers when playing an instrument), and memory work calling on mindful concentration. Through the Community Music School in Buffalo, classes like “Peter & the Wolf” allow children to embrace these ideas. Sean Crawford, children’s program chair, leads the class in pairing characters to instruments. Then they understand why the flute depicts the flighty bird or how the bassoon illustrates a grandfather. Children see their surroundings through a different lens. “It’s time away from any other influence; a way to release something they didn’t know they needed,” said Musejar owner Vanessa Frost, as she shows the papier-mâché dinosaur eggs created from one boy’s imagination. 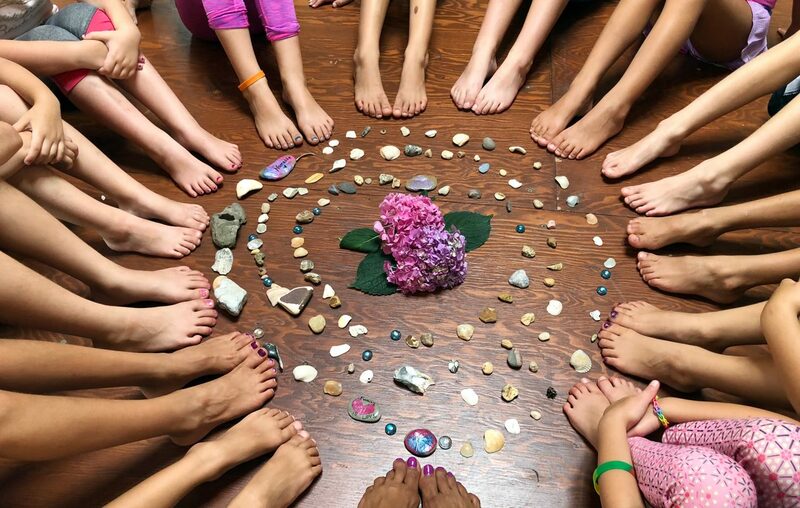 Nature and Mindfulness art camp, painting, and clay are popular at her art studio for this creative awakening. No matter the medium, children enjoy mindful classes without anxiety or competition: Their practice is their own, without rules or comparisons. It’s a safe space to practice mindfulness. And for a child, that’s the most important super power of all.